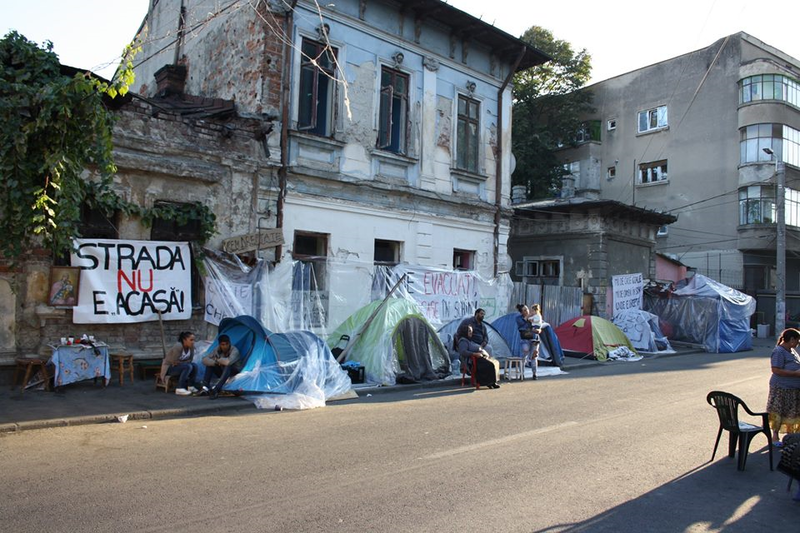 Over 100 people living in a yard of houses on 50 Vulturilor Street, Bucharest, Romania, were forcefully evicted on Monday, September 15. The community has decided from the outset to protest and reclaim their rights. This fundamental right has been gravely violated when local police brutalized several members of the community on the 15th and the 16th of September. Among those targeted were children, elderly persons and persons with disabilities. The evicted have currently no genuine alternatives for relocation. 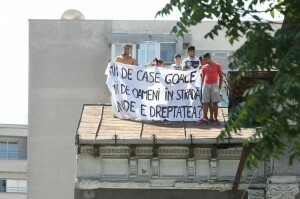 They consider the treatment of officials a blunt breakage of their rights and a racist act given that most of the evictees identify as Roma So far 50 Romanian organizations joined the solidarity network progressively built with the evicted community on Vulturilor Street, either by asking local authorities to find immediately an adequate housing solution or by helping the people resist and organize in the street. The community is determined to keep protesting until their demands are met and the housing issue becomes a priority for the state and local authorities! The Vulturilor Resistance Camp is not an exceptional case, as thousands have been evicted in similar conditions in the last 10 years. This protest, however, carries the important message of NO MORE! People of various social, cultural and economical backgrounds are coming together in support of the camp for what might become a social movement for housing rights! Already, other groups of evictees in other parts of the city have showed concrete solidarity by coming to the camp and enabling resources for the resistance. We call for support and solidarity from all over the world! If you think housing rights are not to be messed with, we ask you to join as well, expressing your solidarity! Share the story within your activist network! Make a photo or video with a banner showing support for the Vulturilor Resistance Camp! Protest in front of your local Romanian Embassy! Say no to social and housing injustice enforced by racism, criminalization of the precarious and the sanctity of property! Contribute with resources, financial or otherwise! Contact the Common Front for Housing Rights at fcdloc@gmail.com. The land corresponding to Vulturilor 50, with an approximate surface of 2300 square meters, was returned in July 2002 to former (before socialist nationalisation in 50’s) owners, on the basis of restitution law 10/2001. In 2002, the owners concluded lease contracts with all former state tenants living in the houses, in accordance with the provisions of Government Emergency Decision 40/1999 concerning the protection of tenants. The new lease contracts were concluded for a period of 5 years. In 2007, the owners sold the land and the litigation rights to the consultancy firm SC New Bridge Partners SRL, managed by a Norwegian citizen. In 2008, the firm brought eviction suits against the tenants. It won in 2009 with the court ordering the eviction of the tenants. The decision was not contested by the latter owing to their lack of any kind of legal expertise and the insufficient funds for hiring a lawyer. Most of the tenants have been living in the Vulturilor yard for 20 years, having been assigned there in the beginning of the 1990s by the state companies for which they worked. Since the 2009 expiry of the new contracts concluded with the owners and up to now, the tenants have been living in those homes without legal documents. Not having the possibility of renting or buying apartments on the market, the majority continued to live in the houses from which they had been told they were going to be evicted. The requests for social housing, submitted to the district city hall and renewed throughout the 12 years since the restitution of the land, were left unsolved. The requests submitted to the capital (central) city hall were redirected to the city hall of District 3. The tenants began receiving walking summons in 2011. They continued to live in the houses in the absence of an alternative for living spaces and abandoned by local authorities. The new owners limited their proceedings to those summons and did not approach them formally for several years. On the morning of September 2nd 2014, all the families received, besides the summons to leave the houses no later than 8 days, a notification about the forceful eviction in case of non-compliance, scheduled for September 15, 9:00 am. On Monday, Sept 15 the community on Vulturilor street has been evicted against their will by court officers assisted by riot police. Forcing their way in the courtyard and hitting several protesters, the riot police flooded the homes and continued to insult ant intimidate the people into leaving. By way of threatenings, the people at Vulturilor 50 were forced to sign the eviction papers. The local authorities, present through one employee communicated that the evicted were expected to relocate, separately, to men’s and mother-and-children night shelters, a provisional solution which they refused. Starting with 2 pm, people at Vulturilor were gradually emptiing their former homes. This process did not finished when the security firm employed to guard over the propriety showed up. They threatened to attack the people if they would not comply with leaving the premises. Next, the guards sealed the gate and started destroying the improvements made by the former residents. A lot of the belongings remained in the houses, only to be destroyed and confiscated by the security firm. On Sept 16, at 9:00 o’clock, after a first night spent in the street in front of their former homes, part of the community on Vulturilor 50 set out to protest in front Bucharest’s City Hall. Equipped with signs, banners, and megaphones, people demanded their rights: homes for everyone. For several hours, people demanded that the mayor or other relevant authorities show up, but their demands have been completely ignored. Around 12 o’clock, while part of the evicted community was protesting in front the City Hall, the Local Police showed up on Vulturilor with 7 vehicles, 2 vans belonging to the military police (Gendarmerie), and 5 trucks from Rosal (garbage collecting company), to collect the possessions people were storing on the street, under the claim that they obstruct public space. People opposed this action, saying that that was their camp, set up for shelter and protest. Still, people’s furniture and other belongings were taken by force and moved to Rosal’s warehouses, against their owners’ wish. They will be kept there for 15 days, then they will be thrown away unless the owners reclaim them. But where are people going to take them? While opposing eviction and, later, confiscation, several people were pushed and hit by employees of the Local Police. The victims included children and teenagers. One of the children was also insulted by a member of the Local Police. Under threats of beatings and more confiscations, the street was eventually mostly cleared. But the community stayed, people being determined to maintain the camp, despite cold weather and lack of supplies. Children, young people, and ill people spent their night on chairs, blankets, mattresses, and sleeping bags, in the wind. More than half of the community spends both nights and days in the street, with no possibility for shelter. On the following days, people are completing and updating their files for social housing. The authorities keep refusing to engage with the people hoping that they will become divided and eventually abandon the protest and their demands. But all the intimidation attempts by the police, since the eviction day and up to today, were unsuccessful. The community on Vulturilor is not giving up and is resolute to continue resisting until its demands are met. It is appealing to the solidarity of anyone who sees housing rights as fundamental ! On Friday, 19.09, the community protested in front of the City Hall again. Once more, their demands were ignored. The protesters were eventually dispersed by the police. Later that day, the police showed up at the camp, telling people that the remaining of their belongings (mostly mattresses & chairs) will be confiscated again, unless they agree to store it “out of sight” during the day and only take it out at night. As the police came together with a Rosal truck, this was not so much a negotiation as it was an ultimatum. Each time the evicted protested in front of the city hall, the local police force showed up intimidating the community on Vulturilor. People are getting punished for resisting their exclusion, the social cleansing and the racist policies. We’re calling activists and social movements worldwide to show solidarity for housing rights of the people on Vulturilor street in Bucharest, against the police brutality and intimidation inflicted upon this community. Since the 20th, the Vulturilor community has raised a protest camp to resist hard weather conditions, determined not to abandon the struggle. Seeking justice for their loss, the community demands housing justice having in mind the amplitude of the phenomenon in the Romanian context. The authorities cannot keep ignoring thousands of evictees and people with housing issues. This account is only one example of many, considering that Romanian local authorities have no concern or respect for housing rights. As a matter of fact, the Third District City Hall allocated in the last 9 years only 33 social houses, while currently they have 3150 such requests registered. The community is determined to keep protesting until their demands are met and the housing issue becomes a priority for the state and local authorities! So far 50 Romanian organizations joined the solidarity network progressively built with the evicted community on Vulturilor Street, either by asking local authorities to find immediately an adequate housing solution or by helping the people resist and organize in the street. Both the Vulturilor community and the solidarity coalition call for immediate support! Report compiled by the Common Front for Housing Rights (Frontul Comun pentru Dreptul la Locuire), fcdl.ro. and the community of Vulturilor 50. Get back to us at fcdloc@gmail.com.